Many eCommerce websites are losing out on 12% or more by not accepting PayPal on their website. Did you know that PayPal handles 12% of the eCommerce transactions in the United States, and 9% globally? Every second of every day, PayPal pumps $2,000 of transactions through it’s systems. That’s $173 million in transactions per day. Yet most websites ignore PayPal and only allow visitors to purchase with Visa or MasterCard. I think this is a mistake. With PayPal I just need my email & password Because I have a PayPal account, and it’s tied to my bank account and a couple of credit cards, all I need to do to make a purchase is log in with my email address and password. And boom — it’s all set. Have you ever had the frustrating experience of trying to remember where the credit card you want to use is located? And then… what’s the correct billing address again? How it Works: A user goes to the PayPal website and creates an account. They can add a credit card to their account or tie it directly to their bank account. To verify your financial information, PayPal will often make two small deposits into your bank account (a few cents). You then verify your information by entering in these amounts into your profile. 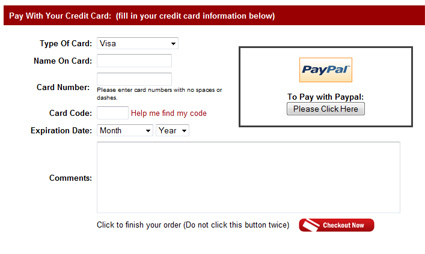 When you wish to make a purchase, you log into your PayPal account with your email address and password. You then verify the amount, who the payment is going to, and select what method of payment you’d like to use (credit card, bank account, etc). After you hit submit, the money is taken from your account and then sent off to the other party. PayPal is not just for making purchases — it allows you to send money to friends and family, even overseas. Advantages: Quick. Fast. Easy. Free. Added protection for consumers. Company doesn’t receive your credit card information. Disadvantages: The biggest drawback is that some merchants will take longer to process a PayPal payment vs. a Visa or MasterCard payment. In some cases, this can delay an order by a day or so. Summary: Give your customers a choice – allow them to checkout with PayPal.